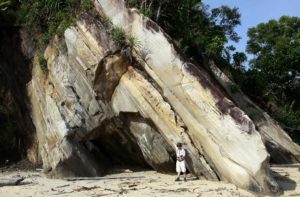 Vietnamese Geologist in front of an uplifted and tilted transgressive sequence of sandstones that prograded out into a Tertiary foreland basin with higher energy than the quieter, slower deposition of the Phosphoria Formation which occurred in a much older foreland basin in North America. Image captured in northern Borneo by GJH member David Weichman. Permian time is best remembered by the earth science community as an ending. It expired in a desperate fizzle that marks the greatest extinction event known to science (aptly referred to as “the Great Permian Extinction”) and from its paleozoic grave sprang forth the entirely new world of the mesozoic, replete with oxygen and carbon dioxide levels that were all over the map both low and high, unparalleled diversity, dense jungles, and most famously, dinosaurs. But there remain reasons to pay our respects to the Permian. In Permian time, all of the continents were mostly attached together as one landmass, and Wyoming – which was near the equator at the time – was on the west coast of, well… the whole world. But it was a different kind of coast, insofar as it was frequently under sea level in a foreland basin between the always shifting continental margin and the cratonic shelf to the west. This land-sea juxtaposition of Idaho and Wyoming gave rise to the Permian Phosphoria formation, which represents around 15 million years of depositional sequence that in places measures over 1,300 feet thick. Because these deposits were generated mostly in a shallow sea fed by upwelling nutrient-rich cool waters from the deep abyss beyond the cratonic shelf, life was plentiful and the geochemistry was ideal for deposition of phosphorite beds that rival similar sources world-wide. No one was around at the time to marvel at how important these Permian deposits would become for America and the world 260 million years later. You might have to ask 100 people what resources modern society could not live without before someone would mention phosphate. But they would be correct. Phosphorus is a key component in RNA and DNA molecules, and therefore critical to both plant and animal life. It is in every cell in the human body. It is an absolutely essential plant nutrient for which there is no substitute. It is the backbone of modern agriculture. Regarded as a strategic and limited natural resource, some argue that exporting our phosphate to foreign markets is a critical mistake for which we will pay dearly when our supply is exhausted (Strategic Mineral – The Phosphate Risk). There are differing opinions about when we will run out of our domestic supply, but estimates for “peak phosphorus” generally range from 30 to 100 years (Phosphate – Wikipedia, the free encyclopedia). As is the case with most of the resources upon which our lifestyles are totally dependent, phosphate mining, production, and even use come at an environmental cost. The domestic phosphate industry appears to be sensitive to this issue and has to varying degrees gone to great lengths to mitigate the environmental costs. This Tuesday, (April 21st) at the Teton County Library Auditorium at 6:00pm., industry representatives Julia Fletcher, Steve Gilmer and Brody Gibson from Agrium, Inc. will be here to share their considerable knowledge about phosphates and the Phosphoria formation. How much do we have and when will it run out? What are the environmental costs associated with its production and use? What will we do when it is gone? For the answers to these questions, be sure to drop in this Tuesday.